Outdoor group portrait of members of the 1st Reinforcements, 4th Battalion. Identified front row, second from the left is: 1134 Lance Corporal (LCpl) Anton Herman Iversen. 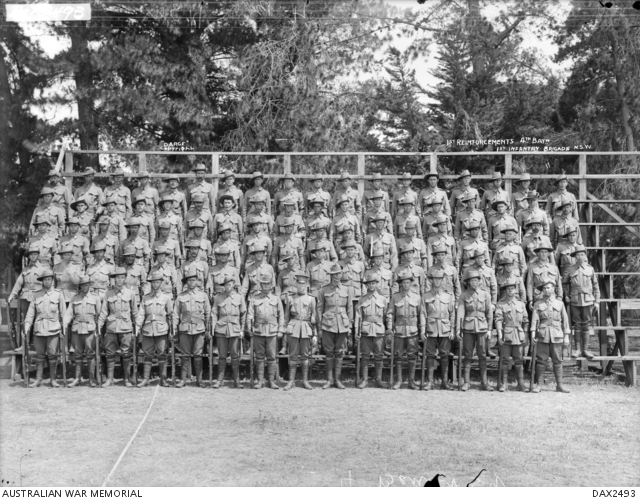 Also known to be in this photograph are- and note that the officers and senior NCO’s were routinely posed in the centre of the front row- Captain Harold Jacobs; 1102 Private (Pte) Sydney Charles Boysen; 1103 Pte Harry Bradford; 1104 Pte Harry James Blunt; 1106 Corporal (Cpl) Claude Casson; 1107 Cpl Albert Frederick Cook; 1108 Pte William Reginald Carey; 1109 Pte Jack Clump; 1110 Pte John Douglas Walters Clague; 1111 Pte Charles Clark; 1112 Pte Henry Coffey; 1114 Pte Augustus James Chalker; 1115 Pte Robert Charles Claydon; 1116 Pte William Edward Claydon; 1117 Pte Frederick Daniels; 1118 Pte Hertle Hilton Ezzy; 1119 Pte Richard Asaph Edwards; 11201 Pte Arthur John Flintoff; 1122 Pte James Forbes; 1123 Pte Alexander Cosgrove George; 1124 Pte James Alexander Gould; 1125 Pte Kenneth Gillies; 1126 Pte William Alexander Gibson; 1127 Sergeant (Sgt) Richard Greaves; 1128 Pte Charles Neil Galbraith; 1129 Cpl Thomas Haworth; 1130 Pte Ernest Herbert Henning; 1131 Pte Thomas Halsey; 1132 Pte Patrick Hanley; 1133 Pte George Charles Hokin; 1135 Pte George Johnson; 1136 Pte Charles Henry Kerry; 1137 Pte George Long; 1138 Pte William Lampshire; 1139 Pte Carl William Leyon; 1140 Pte Victor Harold Lyne; 1141 Pte Arthur Herbert Lawton; 1143 Pte Edward Keighly Lane; 1145 Pte George Henry Lyndsell; 1146 Pte Stanley Gordon Moore; 1147 Sgt Dugald Dalroy McPherson; 1148 Pte Thomas McKinty; 1149 Colour Sergeant Alastair Cameron Maclachlan; 1150 Pte Hugh McKiernan; 1151 Sgt Henry McKeowen; 1152 Pte David McGregor; 1153 Pte Francis Alexander McInnes; 1154 Pte Donald William McInnes; 1155 Cpl Thomas Henry McEnery; 1156 Pte Jack McDougall; 1157 Pte Cornelius Francis Murphy; 1158 Pte John James McCormack; 1159 Pte Frederick George McGrath; 1160 Pte Oliver Frank McCarthy; 1161 Pte Henry Mark Marks; 1162 Pte Albert Frederick Clark Mower; 1163 Pte William Arthur Montgomery; 1164 Sgt John Beattie Nelson; 1165 Pte Charles Arthur Morris; 1166 Pte James Richard Nunn; 1167 Pte Phillip Owen; 1168 Pte James O’Connor; 1169 LCpl James Alexander Preston; 1170 Pte Harry Preston; 1171 Pte George Peterson; 1172 Cpl Albert Edward Roberts; 1173 Pte Dennis Robinson; 1174 Pte Thomas Robinson; 1176 Pte John Richardson; 1177 Pte Frederick William Richards; 1178 Pte Charles Aubrey Roberts; 1179 Pte Benjamin James Shepherd; 1180 Pte Leonard Spencer; 1181 Pte William Sweet; 1182 Pte Charles William Nelson Swanson; 1183 Pte Francis Robert Smith; 1184 Pte William Oliver Sleeman; 1185 Pte Abraham Schneider; 1186 Pte Vincent Joseph Scally; 1187 Pte William Henry Stevens; 1188 Pte William Tacey; 1189 Pte John Thompson; 1190 Pte John Archibald Turner; 1191 Pte Frederick Claude Turner; 1192 Pte John Temmie; 1193 Pte Robert Donald Usher; 1194 Pte Douglas Gordon Whitely; 1194 Pte Frederick Charles Waine; 1196 LCpl George Malcolm Willmore; 1198 Pte Philip Workman; 1200 Pte Kenneth Cameron; 1201 Pte George Anderson Howes; 1202 Pte Percy Pickard; 1203 Pte John Smith; 1204 Pte Thomas James; 1205 Pte Alexander James Young; 1207 Pte Harold Montague Lawrence; 1208 Pte Walter Charles Speechly; 1209 Pte John Green; 1210 Pte Edgar William Hickling; 1211 Pte Benjamin Gladding.